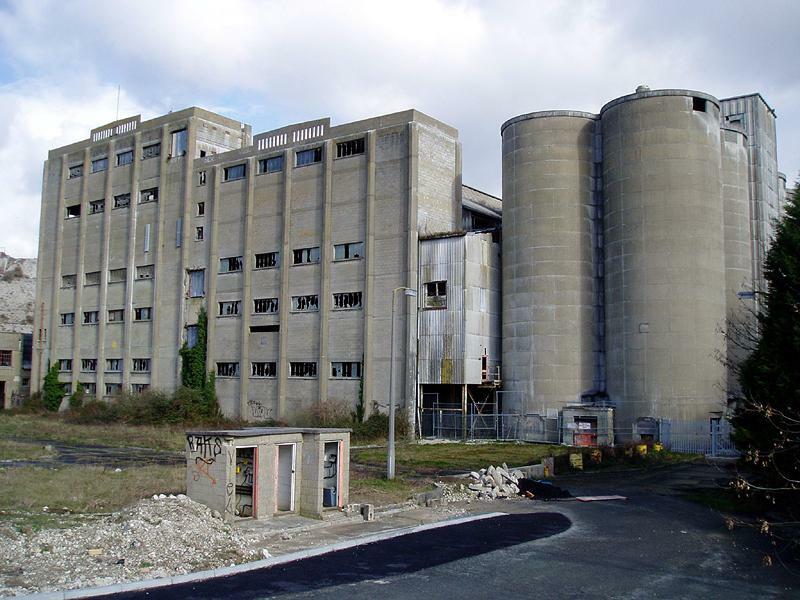 I honestly think that Shoreham Cement Works, straight off the set of the film Aliens, is the scariest building that I have ever set eyes upon. Anyone who has seen the derelict Blue Circle buildings’ ghostly silhouette on the way to Upper Beeding from Shoreham on a cloudy night will agree. The present buildings were erected in 1949 and production ceased in 1991. The quarry actually dates back to 1851 and cement was manufactured on the site since at least 1898. A tunnel under the road separates the distribution plant and administrative blocks (west) and the industrial site and chalk quarry (east). Clay was obtained from pits a short distance up the River Adur and coal was brought in by rail. The cement was fired in two enormous 350ft kilns. The works is considered a fine example of the technology of the post war period and is still largely intact. I remember taking a trip to the building in the dead of night quite a few years ago with my brother, Matt. The main building was completely secure but an isolated outbuilding was open from which a covered conveyor belt led right up to the roof of the main building. Standing up on that roof with no guard rails was one experience that I won’t forget in a hurry. It was possible to negotiate the various broken gangways and holes in the floor all the way down to the flooded ground floor. We were even able to stand directly under the monstrous chimney that can be seen from miles away. Dangerous but fun! A planning application to demolish the derelict buildings and develop the site was turned down in 2003 on the grounds of overdevelopment after a public inquiry. The proposed scheme included 84 homes, offices, a hotel, a restaurant and a pub. Local councillors want the development to be no bigger than what is necessary to return the area of outstanding natural beauty to its former splendour. The site is currently being looked at a as a possible ground for Brighton & Hove Albion as an alternative to the Falmer site. Also, Channel 4 bosses are hoping to blow up the works on a new show called “Demolition”. It is worth taking a look at the site because it probably won’t be there for much longer. I’ll certainly be sad on the day that the giant chimney is toppled.